Spalding Auto Parts has years of experience in providing quality parts and friendly service. Founded in 1934 by Dolph Spalding, the company has grown along with the community and currently provides employment for 190 people. Although much has changed since 1934, the Spalding enthusiasm for providing excellent service is still strong. After all, this enthusiasm has been the greatest reason for our success. At Spalding Auto Parts good service doesn’t stop at the counter. Salvaging methods are continually being refined and advanced to ensure that the customer will be totally satisfied. Spalding Auto Parts management is on a continual mission of acquiring and maintaining the latest equipment and the most up-to-date personnel training to meet the ever-changing recycling trends of cars and trucks of all makes, new and old. These efforts are also supported through Spalding’s membership in the Automotive Recyclers Association. Since 1943, the ARA has represented the automotive recycling industry, which is now estimated to have $7 billion in annual sales in the United States. The goal of the ARA is to further the automotive recycling industry and its benefits to the environment and society by assisting members through various services and programs. The ARA encourages aggressive environmental management programs to assist member facilities in maintaining proper management techniques for fluid and solid waste materials generated by the disposal of motor vehicles. Located on 50 acres in the City of Spokane Valley, Spalding Auto Parts dismantles approximately 3,500 vehicles annually. "Salvagers" will reclaim about 80% of the materials of a car or truck and, along with the fluids, are recycled. 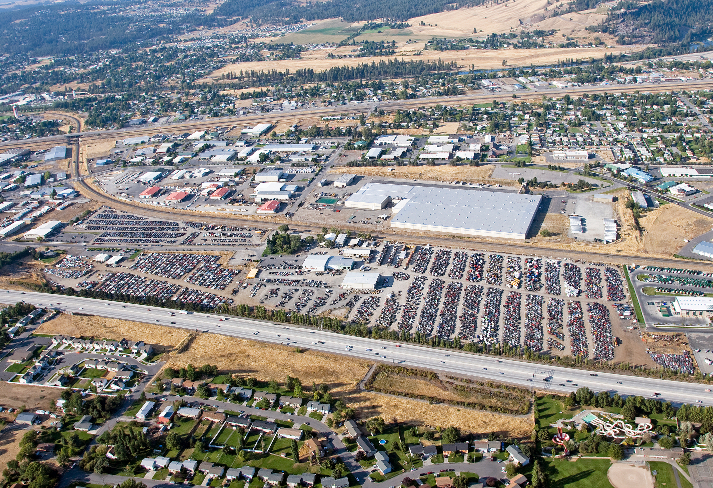 An additional 10,000 vehicles are purchased for placement in the ‘Pull & Save’ yard where they’re available for tool-toting, walk-in customers to find and remove needed parts. Spalding Auto Parts offers engine, and transmission replacement service for most makes of cars and trucks. Depending on availability, Spalding can usually provide new, used, or rebuilt engines and transmissions. All work (parts and labor) has a 6-month warranty. Transporting vehicles since 1934 has given Spalding Auto Parts a keen insight into the rights and wrongs of transporting all vehicle types. We use only top-of-the-line, state-of-the-art methods for safety, durability, and ease of operation. We do the same with the systems we sell. Spalding Auto Parts offers sales, installation, and service for CHEVRON VEHICLE TRANSPORT SYSTEMS. Spalding Auto Parts is proud to offer these quality systems... AFTER ALL; IT’S WHAT WE USE!